The investing icon said the damage done on Black Monday happened late in the day, but 24 hours later the panic was over. As part of our 'Crash of 87 -- TheStreet Special Report' package TheStreet spoke with Bogle about what happened that historic day, the aftermath of Black Monday and whether such an event could occur in the future. On Oct. 20, 1987, John Bogle, founder of Vanguard Group, started taking phone calls around 7 a.m., fielding about 104 phone calls from investors. The day before, a day that would come to be known as "Black Monday," the Dow Jones Industrial Average plummeted 22.6% in a single trading session, but Bogle found that the panic that ensued following the crash was short-lived. One woman told Bogle that if he couldn't help her, she was going to jump out the window, Bogle recalled. He told her not to do so, to which she replied, "Well, don't worry, I live in a one-story house." "She had a good sense of humor," Bogle said in a Skype interview with TheStreet. "And that was the spirit that prevailed in spite of all the unpleasantness when the market dropped by that huge amount of money." As part of our "Crash of 87 -- TheStreet Special Report" package TheStreet spoke with Bogle about what happened that historic day, the aftermath of Black Monday and whether such an event could occur in the future. The crash was the first contemporary global financial crisis, in which a chain reaction of market distress sent stock exchanges around the world plunging in a matter of hours, according to the Federal Reserve. Before the U.S. markets opened for trading on Monday, the Asian markets began tumbling. Bogle said that the "big damage" in the U.S. market was "done pretty late in the day." At that time, Bogle was sitting in an investment committee meeting for a charitable organization. "I didn't really realize what happening until I got home after 6:30 [p.m.]," said Bogle. "But by that time, it was all over the news. Everybody seemed to be in sort of a state of panic." Because there was a municipal bond market crash in April of 1987, Valley Forge, Pa.-based Vanguard had set up what Bogle called, "The Swiss Army," training everybody to be able to answer the phones in times of increased telephone volume. "We held the line very well in telephone volume on the actual day," Bogle, now 88, said. "The next day, I thought the most useful thing I could do was find out how the shareholders were actually feeling," said Bogle. "The heck with all the data. Let's talk to some real-life human beings and see how they react." After speaking with investors, however, Bogle was convinced that the panic was over. "The industry proved to be quite resilient and shareholders were quite resilient too," said Bogle, adding that for the year as a whole, the Standard & Poor's was up in 1987. Following the crash, a number of rules were put in place as safeguards against extreme market volatility, including the so-called circuit-breaker provision of the New York Stock Exchange's Rule 80, which is designed to temporarily halt trading in specific stocks or across markets. But Bogle said most of the rules haven't had to be used very often and haven't had much of an impact. "The best advice I could give regulators is let the markets clear," said Bogle. "Sooner or later, they are going to clear." 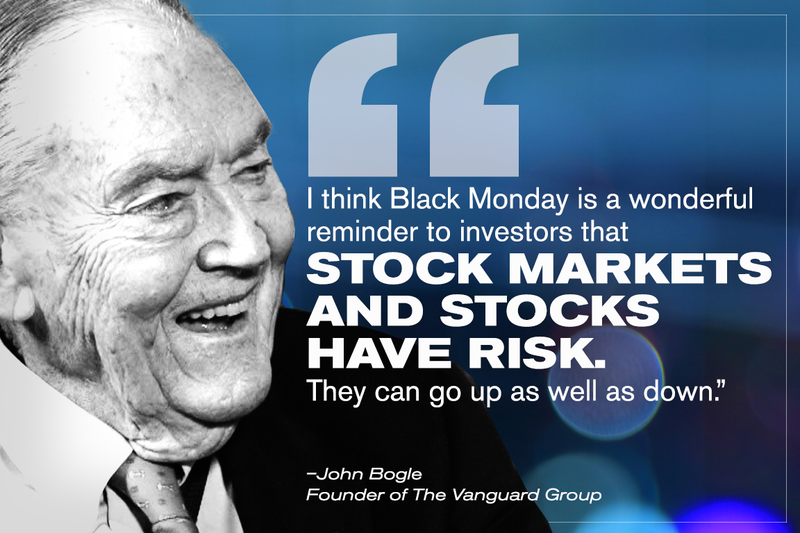 The Vanguard founder said that Black Monday serves as a "wonderful reminder" to investors that stock markets and stocks have risk and can oscillate up and down. He added that even if stocks are down, they don't stay down forever. With the Dow hovering around 23,000 its hard to imagine that stocks can stay this high forever, as well. Bogle said in 2007 that Black Monday was a Black Swan, an event that is regarded as impossible or highly improbable. He can't predict when the next Black Swan event will occur but said we could have another period like Black Monday. "I think it is highly unlikely but you better believe that with the stock market, anything can happen," said Bogle.